About Eriko S. Message Eriko S.
The Tokyo Nightlife tour with Eriko was excellent. As a solo traveller I found Eriko very friendly, great company and she has excellent English language skills. She meet me at my hotel and was very helpful in explaining the train system. I felt completely at ease as she guided me through the busy Kabukicho and Golden-Gai areas where we shared a meal. I recommend Eriko to anyone considering the Experience Tokyo Nightlife, particularly solo travellers like myself who may not want to go out at night alone. Eriko will tailor your tour to fit you. Her command of the English language and great knowledge of her city puts her on the top of the tour guides list in Tokyo. We have had a wonderful day with Eriko, who is a truly delightful lady. She listened to our needs, and met them fully. We saw a lot more of Tokyo using Eriko as our guide, and gained confidence in negotiating the Tokyo metro system!! We saw a mix of the old, and the new, which is how we wanted it. We have some great memories and would throughly recommend Eriko as a guide. Her English is excellent, which is always a great benefit when there are things to explain, and questions to answer. Eriko has been a fantastic guide for our three days in Tokyo. She is very kind, efficient, knowledgeable and her English is absolutely perfect. Should we come back to Tokyo we would certainly hope to have her again as our guide. My tour was excellent. My tour guide Eriko was very knowledgeable, and her English was perfect. Not only I got to visit the main attractions of the city but Eriko made me experience Tokyo in a way that I would never have been experienced by myself. Thank you Eriko for a great experience! Eriko was brilliant. This was our first time in Tokyo and we were completely in Eriko's hands - as well as guiding us to many highlights of Tokyo and providing a great insight into the everyday lives and culture of the people of Tokyo, she was great fun and so knowledgable. Thank you so much Eriko! Our group of four had a lovely day with Eriko. We customised the tour to include the outer fish markets, Buddhist fire ceremony, Asakusa and one of the best sushi lunches ever. Eriko has great English having lived abroad for a number of years and a good sense of humour. We deviated here and there given our love for shopping and food but Eriko was flexible and we never felt rushed. It was great having someone navigate for us which maximises time when there are 12 exits to some subways! Eriko is the BEST TOUR GUIDE EVER!! I had such a wonderful experience with her! There was never a dull moment. There were times with lots of action, in busy streets and markets, but also times to relax and enjoy the tranquility of parks and temples. So there was a perfect balance. I never felt exhausted, as many tours can do to a person. Eriko made my Tokyo trip unforgettably special. I would hire her time and time again. She is professional, courteous, knowledgeable, kind, funny and really fun! Eriko was a fantastic tour guide. She met us at Haneda airport where we had a long layover and we spent about 7 hours seeing some of the highlights of Tokyo as we had not been there before. You obviously can't see and appreciate Tokyo in a day but she did a great job showing us some of the highlights and was super informative teaching us about Japanese culture and tradition. She's an absolute pleasure to be with and my family of 4 highly recommends her! Eriko was great. She was patient with my 11 year old and was fun to spend the day with. Her english was excellent and had a good sense of humor and a passion for her great city. Highly Recommend. Eriko is very responsive and helpful right from the beginning - starting from planning the day itinerary to shopping and lunch suggestions. Her English is excellent, and she is very nice and fun to spend the day with. Our family had a great time in Tokyo with a great combination of old traditional and new modern sides of Japan. Fantastic! Eriko was really wonderful, warm friendly and helpful, like meeting an old friend to show you around! We saw great places, learned history, local customs, useful phrases, using transport, money, etc. Felt confident to continue our travels in Japan after. Highly recommend for first time travellers to Japan / Tokyo! Thanks Eriko so much! Best start to a holiday ever. Eriko was very easy to work with. She has great knowledge of Tokyo area. A very charming, knowledgeable guide that openly exuded her joy in what she does very well - show visitors Tokyo. Eriko was very accommodating in helping us to determine which parts of this vast city were of interest. Eriko's command of English is A1, as is her inbuilt GPS navigation through the maze of the Tokyo subway system, the only EFFICIENT way of getting around. Eriko was great! We have used tours by locals in a dozen places and never had a tour guide better. She was so generous in answering our personal questions. She gave us a better understanding of Japanese culture than we could have gotten in any book or TV show. And, she's fun to be with. Highly recommended! Eriko led us through Tokyo with grace and the intimate knowledge of a born-and-raised local. She was wonderful with our children (ages 8 and 10), and curated a great 2-day experience for us to see major sites, and experience both old and new Tokyo in every way. We thoroughly our enjoyed her company and felt that our time in Tokyo was even more special because of her presence on our adventure. We spent a wonderful day touring Tokyo with Eriko. We would not have seen half of what we saw without her expertise and ease in navigating the transportation system. The information that she shared with us about the history and traditions of Japan/Tokyo really enriched our experience. We visited a full complement of temples, shrines, gardens, etc. and she kept the itinerary diverse, flexible and interesting. At the end of the day, we invited her to come to the U.S. and visit us! Eriko is the best! Eriko was a superb guide. She was very knowledgeable, pleasant and interesting company. She was also elegant and charming with a sense of humour. Eriko explained the history and traditions of Japan and the places she took us to. We only wish we had booked her for our entire stay. We recommend her 110%. Thank you Eriko. Eriko did a great job of tailoring the tour to my interests. In addition to seeing parts of Tokyo only a local would know I feel like I spent the day with old friend! This tour will be one of the real highlights of my visit to Tokyo. Thank you Eriko! Eriko is and splendid guide. Very knowledgeable abaout Tokyo. She was amazing adapting the tour to our needs and wishes. Highly recommended. Eriko was an amazing guide! Once we booked our tour we sent a few emails back and forth in order to come up with the perfect itinerary for our day. Since this was our first day in Tokyo, Eriko did a great job to get us set up with a metro card and explain the train system to us so we could easily navigate it on our own for the rest of the trip. Eriko is very knowledgeable, kind, and a lovely person to be around. She taught us so much about Japan in just one day and I feel like we gained a friend! We chose to do a half day tour with Eriko on our last day in Tokyo in August. She took us to a less touristy area where we visited a Shinto shrine and a Buddhist temple for the fire ceremony. Both were very interesting and we were able to freely chat with her about what was happening and Japanese culture and life. We then traveled to the Akihabara area to check out the 'electric town'. We really enjoyed our time with Eriko. She is a very knowledgeable person and her tour was relaxed and friendly. We had a great 1.5 days with Eriko in Tokyo - among other things Akihabara (VR games etc), Shinjuku - Shaved Ice on top floor off Tokyp City Hall, Senso-ji temple, Meji shrine and park and a fascinating Buddhist fire ceremony. Eriko was particularly personable and the whole family connected well with her. Her English is excellent after stays abroad in Australia and Canada. She also had a very interesting perspective on Japanese culture after having spent time abroad. I can definitely recommend Eriko. It truly was a perfect day! After fantastic suggestions by Eriko-san, we decided on an itinerary of old and new Tokyo as I have my teenage boys on this trip. Eriko-san is knowledgable, organized, and has a wonderful personality which made for a fun and busy day. Watching her navigate the city, made it so much easier to navigate the trains and subways on our own thereafter. We visited Meiji Shrine, Harajuku, Akihabara, Monzennakacho, Sensoji Temple and Tokyo Skytree. Domo arigato gozaimasu Eriko-san! Look no further than Eriko - she is the best (6 out of 5 stars). Her background in international travel/hospitality (with major worldwide hotels), her extensive international travel, and excellent English make her the best choice for your Tokyo visit. 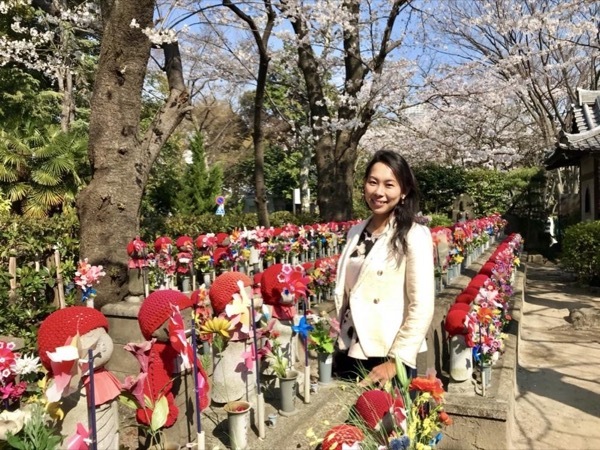 She demonstrates total commitment to making your visit enjoyable --- she arranged complicated restaurant reservations (Sumido fireworks festival), guided my 20-year old daughter while I had business meetings, and offered a range of sightseeing choices. Our custom tour with Eriko was fantastic — everything we expected and more. In the sweltering heat of mid-July, Eriko maintained an incredibly graceful composure and helped us all feel cooler following her lead. She is very knowledgeable and was able to accommodate all of our interests. Eriko is a true 5-star guide and we are grateful to have spent the day with her. It was one of the best tours we have ever done. Eriko is so kind and knowledgeable. Highly recommended. Eriko was fantastic, everything you would want in a guide. She was flexible, patient, kind, and knowledgeable. Even went the extra mile to help us secure our transportation for the rest of our trip. I highly recommend Eriko as a guide. Eriko guided me around Japan and showed me different cities. her knowledge was interesting about old Japanese story about 2 fishers caught gold statue and took it to their master and build the temple, I think the temple was in Asakusa city if I am correct, and information about lion the protector and wolf the passenger. I enjoyed my time with her learning one of their cultures at fire temple. so and the end I recommend you to choose Ms Eriko. being around her like I know her for years as a friend. Eriko is a wonderful tour guide. She very informative, helpful and accommodating in planning an ideal itinerary that complimented other tours we had planned, and that focused on our particular interests. We spent a wonderful day with her seeing some of the most popular sites of Tokyo, including the Meiji Shinto Shrine, attending a Buddhist fire ceremony, the Akihabara technology area, bussiest crossing in the world, etc. Eriko is a wonderful conversationalist and utterly charming. Highly recommended. It was a pleasure to tour Tokyo with Eriko. She is very knowledgeable of the city and its wonderful culture and history. Eriko is a wonderful person and an outstanding tour guide. Highly recommended. It was a pleasure to tour Tokyo with Eriko. She is very knowledgeable of the city and its wonderful history and culture. Eriko is a wonderful person and an outstanding tour guide. Highly recommend. My daughter and I had the most incredible 3 days in Tokyo thanks to Eriko. She is an incredibly knowledgeable tour guide that is able to customize the tour at any point to work with her audience. We learned so much about Japan from Eriko as well as seeing all of the sights. She also is just a pleasure to be around. I really cannot say enough to recommend her. She is a fantastic tour guide. Eriko was excellent & spoke fluent English. It was like walking with a long time friend even though she wore a kimono. Her attire gave an authentic feel about Japan & we could ask her questions that had intrigued us about Japanese culture. We will surely recommend her to our friends traveling to Japan in the future. Eriko was fantastic. She was knowledgeable and wonderful with our 13-year old. We were so pleased with the entire day. I would highly recommend her. We loved her, best guide while we were in Japan! We learned so much and loved her kimonos. Eriko was such a joy to spend the day with while in Tokyo. She met me at my hotel and we walked, as well as used the Metro, to see sites such as the Tsukiji Fish Market and attend a unique Buddhist fire ceremony. Eriko is very thoughtful, kind and articulate. She will bring Tokyo to life for you in a very personal way. Being an experienced traveler herself, she is knowledgeable in many areas and cultures. She will customize your itinerary for whatever you would like to see and do. Thank you Eriko! She was wonderful. So kind and accommodating. We were very lucky to have her. We would highly recommend her. ERIKO - Our absolute Hero in Tokyo - You shared the beautiful City, all your experience and knowledge. You listened to all our needs and requirements and made the days with you fantastic. Thank you for squeezing in as much as possible and making Tokyo so wonderful. You are a Champion and we hope to visit you again. Had a wonderful day with Eriko. She is not only a guide, but also a real companion and such a nice person to spend time with. Eriko is knowledgeable, flexible and speaks great English and has a feel for what you want to do and see. She went to the limits to make our day special, taking us off the beaten track to see really interesting things, we would never have found on her own, such as a wonderful Buddhist fire ceremony. A really fantastic introduction to Tokyo and its people. We highly recommend her! It was a great day and everything I had hope for. We saw many great sites and neighborhoods both new and old. Very flexible on how we spent our day and we also had some great food along the way. She also taught me how to ride the subways so during the reminder of my stay in Tokyo I was able do some of the basic travel on my own. Eriko's English is very good. I would highly recommend Eriko. What a fantastic tour!! Eriko was so lovely and informative. We were a family of three teenagers and she was very patient and kind and has a great sense of humour. We felt very honoured that she was dressed in traditional kimono. There was something for everyone, Harajuku explorés via shopping, Cat cafes, a beautiful visit to Meji Shrine and a delicious ramen lunch. It was very special day for us all. Thank you Eriko! My wife and I scheduled a tour with Eriko starting at Narita. We had a layover that allowed a 3-4 hour tour. We corresponded by email and we decided on a customized tour of Narita. She was waiting for us at the arrival entrance. Then, we took the train to the first stop past the airport and toured the town of Narita. The town has a "pedestrian-only" Street with a Buddhist temple at the end. Eriko was an awesome guide, very friendly and enjoyable to be with. Would happily use her again when in Tokyo. We had a fantastic day touring with Eriko! She adapted the tour to our needs and gave us great tips for the rest of our stay. Eriko's English is excellent and we felt very comfortable with her. We had so many questions and she patiently answered them all so that by the end of the day we felt that we had a good understanding of Japanese culture as well as the history of the city. It was a special treat for us to see her in her kimono and hear about her family history. We highly recommend Eriko! Eriko was a great guide! She was helpful and knowledgeable. She came wearing traditional Japanese attire, which made the experience more fun! She catered to our interests as well (i.e. it was a hot day and we wanted to stop for a beer lol). She was flexible when we made a change to our itinerary and took us to akihabara, which worked out well for us. I would definitely recommend a tour with Eriko to my friends and family! Eriko is an excellent tour guide and we thoroughly enjoyed our Tokyo sightseeing day with her. She tailored the itinerary perfectly to our interests and shared many valuable insights. Her superb English combined with an informal, friendly attitude were truly refreshing - we felt like we were touring the town with a good friend. We would heartily recommend Eriko to anyone interested in going beyond the touristy landmarks and getting the local vibe. Eriko was excellent quickly finding me at our meeting place in the train station and having lots of ideas for what to do since I really had no preferences. She was knowledgeable and easy to talk to. It was a great tour and I can highly recommend her.